We have had an uncharacteristically warm week here in the Bay Area, and I've had a little time off, so I decided to capitalize and break out my warm weather-can't wear to work-but really like them, pieces. 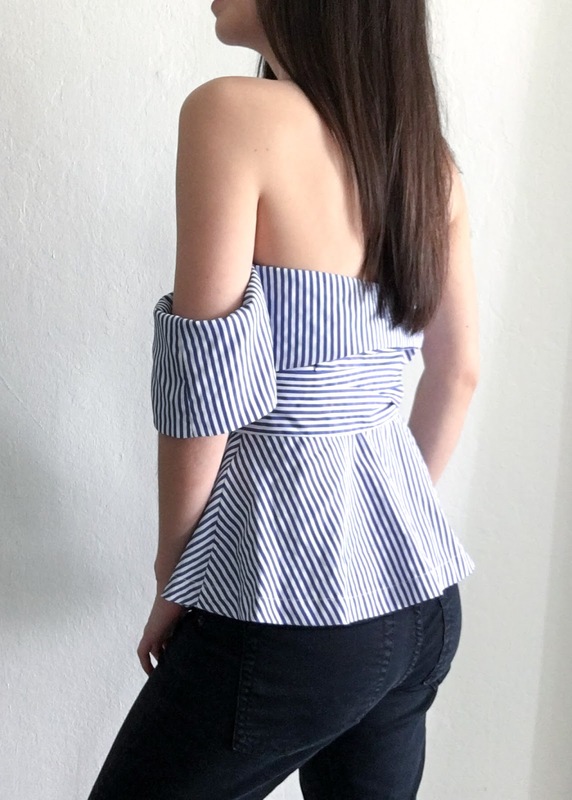 First up is this JOA One Shoulder Stripe Top, which I thought I'd featured on the blog before, but a quick search shows I have not. 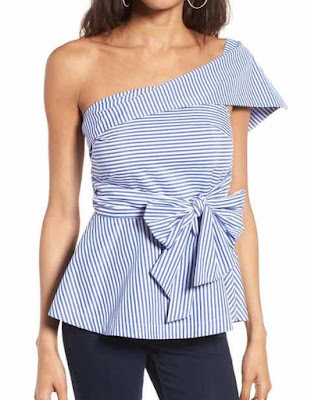 This was a total impulse purchase last summer, at what felt like the height of the deconstructed off-the-shoulder top trend and I pictured myself wearing it on my then upcoming trip to Hawaii. I totally love this top, even though it is a bit impractical, and is a liar (although I think that last part is why it was marked down so much - for example, still available here in pink, for ~$15 (affiliate link)). It was billed as a one-shoulder top, and also shown that way in the stock photo (below). 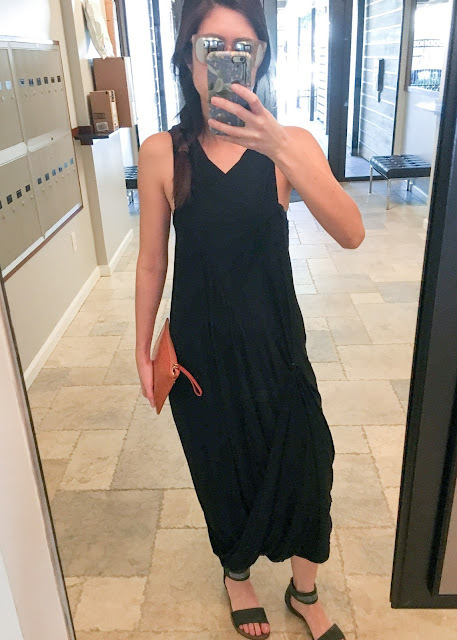 The part around the arm should be able to be worn down (the way I have it) or up on your shoulder. However, despite my best efforts I cannot get the extra fabric to sit on my shoulder like this, and I think to do it would require using a seam ripper to tear open the bottom of the arm fabric. Thankfully, I really like how it looks off-the-shoulder, so I left the arm alone. 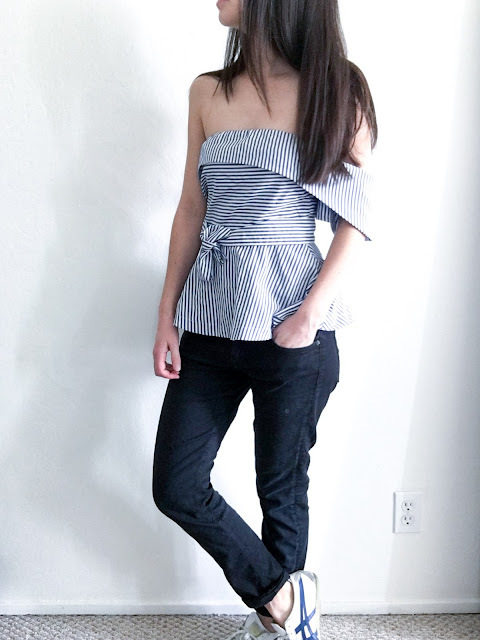 Since this top exposes so much skin, and because it wasn't that warm, I paired it with black skinny jeans and sneakers that mirror the white and blue pattern in the top. Next up, a little whimsy. 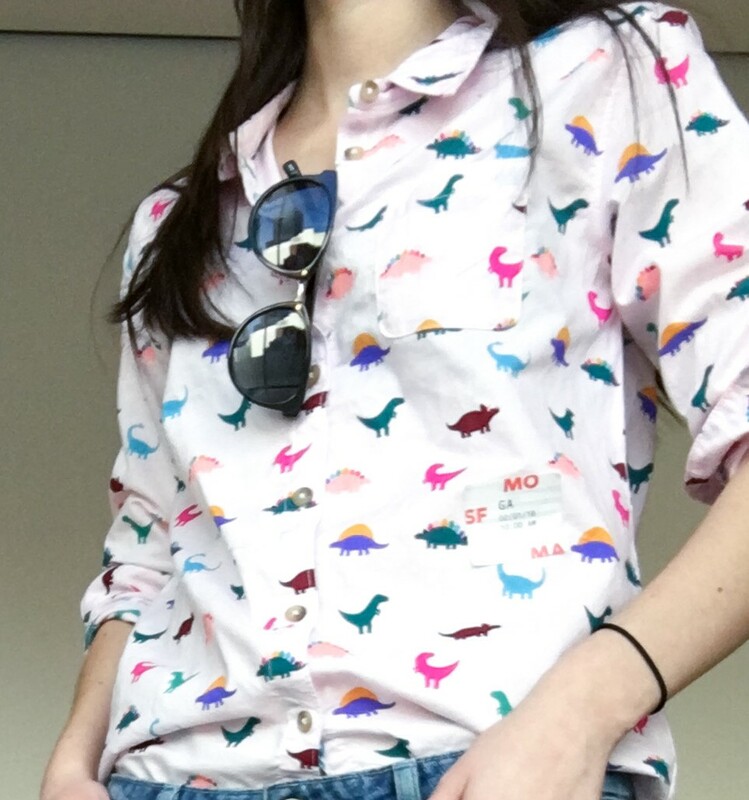 I am only slightly embarrassed to admit that this dinosaur button-up top is a child's top. It is from Target's Cat & Jack line and I am wearing an XL (I looked and sadly, it is no longer available). I am only slightly more embarrassed to say I first saw it on a child, and my initial reaction was, hey, I could totally wear that top. The wee dinosaurs are just so charming and colorful, and from a distance, I don't think it is necessarily obvious I'm wearing small dinosaurs. 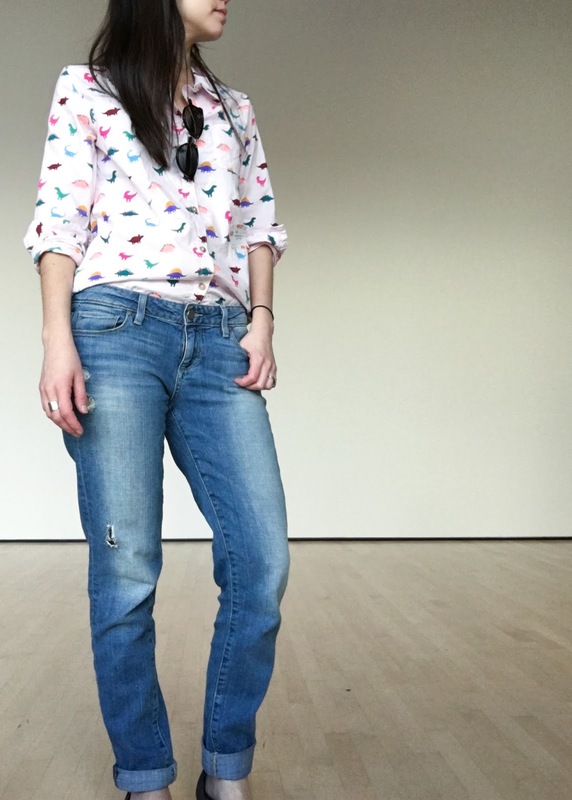 I wore it to SFMOMA (a modern art museum felt like the right venue for this garment) and in fact, the women at the ticket counter complimented it, and then saw it was dinosaurs and was extra excited. A close-up. Also, my SFMOMA admission sticker. Lastly, a slightly more grown-up look. I have always liked the drapey aesthetic of Rick Owens, but didn't think his clothes were that accessible in real life until I saw them pop up over and over on PretaPorterP's blog. RO's pieces are pretty expensive, so I waited and waited until a promising contender popped up on the RealReal. 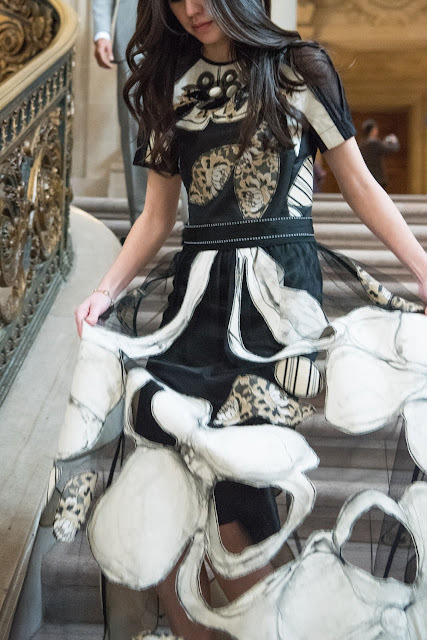 This dress is pretty amazing. The fabric is soft and light and the way the dress hangs is incredible. For example, I am actually wearing it backwards in these photos, but it still looks awesome. 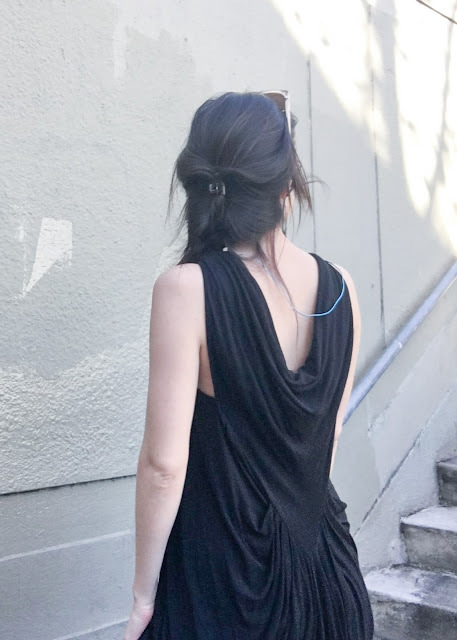 The skirt is cut so that it hangs longer in the back, so I pinned it up with a safety pin in a way I thought flowed with the natural cut of the dress. It is light and airy and even though it is black, was great for sitting out in the park in the sun, no problem. 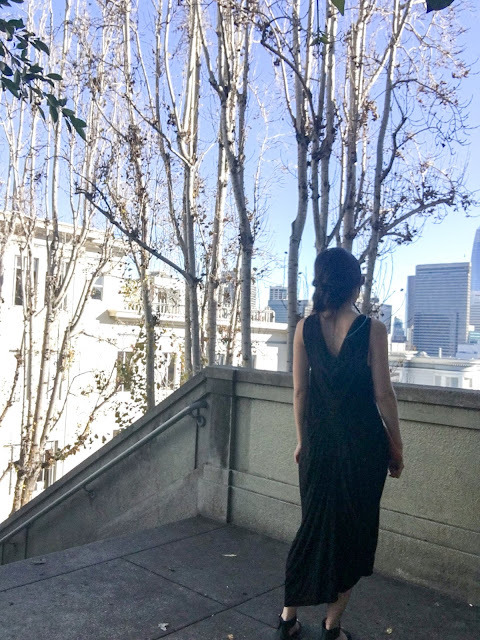 The back, which is actually the front of the dress. Also that blue cord belongs to my headphones. Dinos!! Also dig the joa top. And your commentary. I can't tell if my increased awareness of all things dinos is due to you and A, or if they are just popping up more and more places in really cute ways. Also, thanks!